Developer Quote: "Airports can be stressful and complex to navigate. 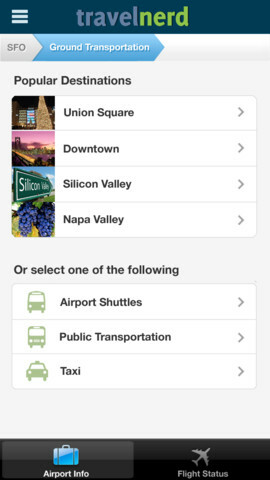 Luckily, there’s Airports by Travel Nerd guide app. This app is perfect for on-the-go travelers who want comprehensive airport information in one easy to use app." This is the season for travel galore to visit loved family and friends! Many people are traveling all the way from Florida to Alaska, on cruises to the Mediterranean, on overseas flights to Europe, Russia, Greece you name it! Since travel is so hectic and airports are so overcrowded, it's good to have a superb game plan when it's time to take the trip you've been longing for. In TravelNerd's guide, find out about restaurants, amenities and shops in the airport. Even more important, prior to that see where parking is available at your departure point, and if taxi sharing is feasible at your arrival destination. 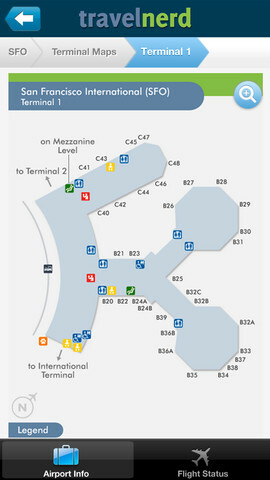 Take a good look at the terminals and view what is located in each. There are over 200 airport terminal maps, so chances are good, your airport is included for your convenience! COOL CONCLUSION: Don't leave home for your travels without Airports by TravelNerd, the airport pocket guide on your phone that is loaded with all the necessary travel information to make your trip smooth and stress-free. --Device: Universal: Compatible with iPhone 3GS, iPhone 4, iPhone 4S, iPhone 5, iPod touch (3rd generation), iPod touch (4th generation), iPod touch (5th generation) and iPad.